The legislature is working on Gov. Rauner’s proposed budget, which calls for drastic funding cuts in programs that protect the health and safety of Illinoisans. 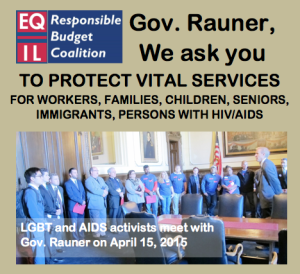 Equality Illinois is part of the Responsible Budget Coalition, which is committed to preserving vital services for Illinois families and communities. We must fight against poverty, ensure access to health care and housing, and cultivate an environment where every person is safe and secure in their school, workplace, and neighborhood. The budget must demonstrate these priorities. Encourage the General Assembly and Gov. Rauner to act responsibly.